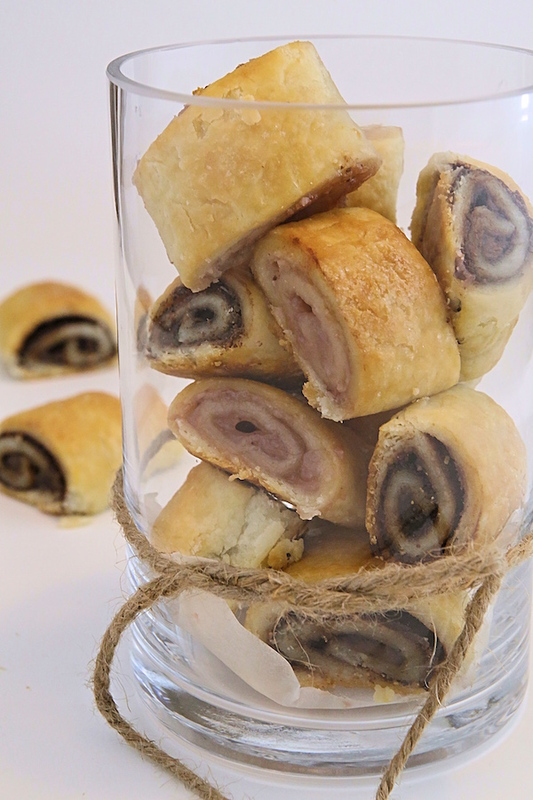 Rugula or Rugelach, by which ever spelling you recognize these rolled pastries sold at Costco, can be made right from home. 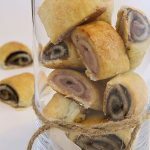 Semi-soft, yet flaky cookies are filled with a chocolate and jam/cream-cheese filling, then rolled creating a swirl like pastry. I think this recipe is very close in taste to the Costco’s version. If you’ve never tried these pastries you should give these a try as they are not overly sweet but yet have a subtle sweet filling. Try both the jam and chocolate variation to see which version you prefer but the chocolate one (or so called the nutella-filled one) is definitely a yummy choice. Nutella actually makes a fabulous chocolate filling that doesn’t tend to leak and it is a chocolate/nut spread which is close enough in taste to the Costco’s version. Give these a try! 1. 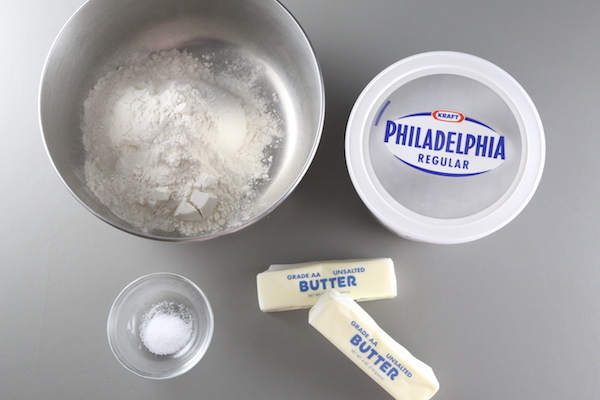 Beat butter and cream cheese until well combined. 2. Whisk the flour and salt and add to the butter mixture. Stir together until a soft dough forms. 3. 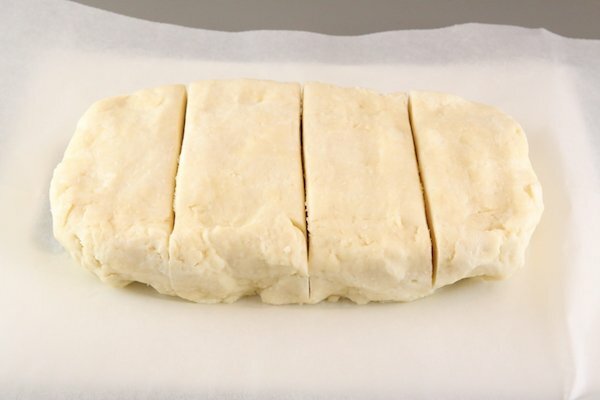 Flatten dough into a 7 by 5-inch rectangle; cover and refrigerate for 1 hr. 4. Cut dough into 4 equal portions. Roll out each piece into a 12 by 8-inch rectangle on a lightly floured surface. 5. 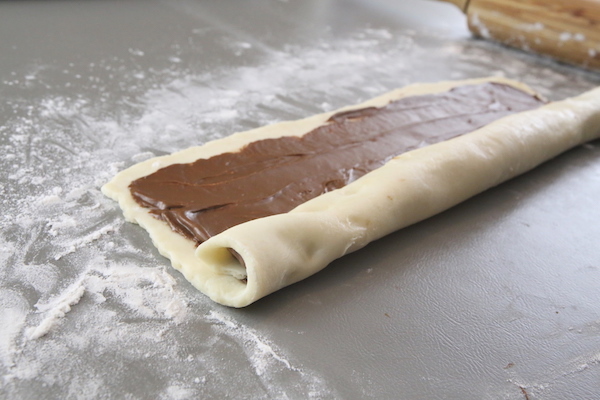 Spread 2 tbsp of nutella onto the dough (or half of the cream-cheese filling plus 1 tbsp of jam.) Roll, starting from the longest side pinching down the ends to seal the roll. 6. 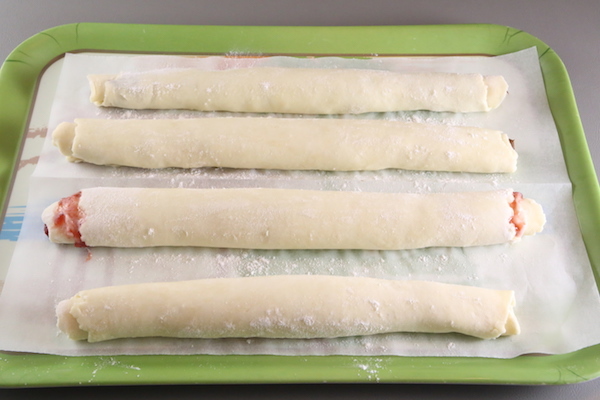 Arrange rolls onto a tray lined with parchment paper. Cover and refrigerate rolls overnight or 12 hrs. 7. Pre-heat oven to 350 degrees F. Transfer rolls with parchment paper onto a baking pan. Brush the tops with milk and cut 3/4-inch deep (not all the way through) into 1 1/2″ thick pieces. Generously sprinkle with sugar over the top and bake for 45 minutes. 8. Cool for 10 minutes then slice all the way through. 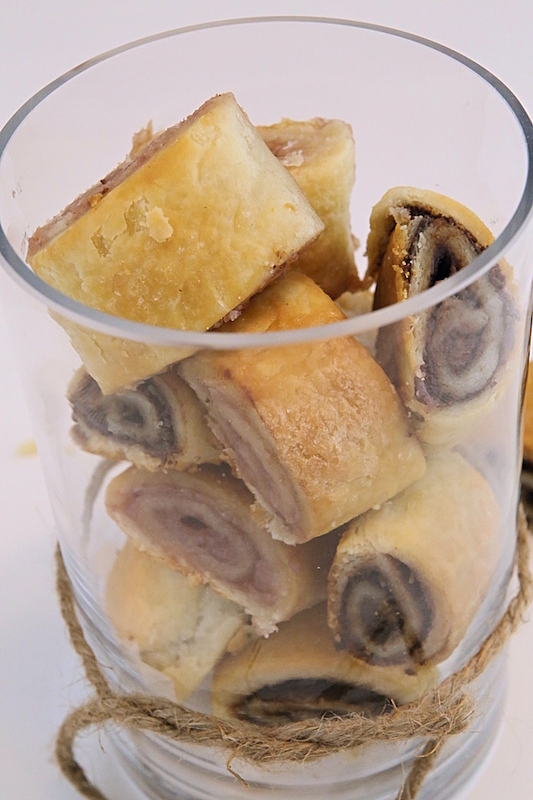 Rugula or Rugelach, by which ever spelling you recognize these rolled pastries sold at Costco can be made right from home. 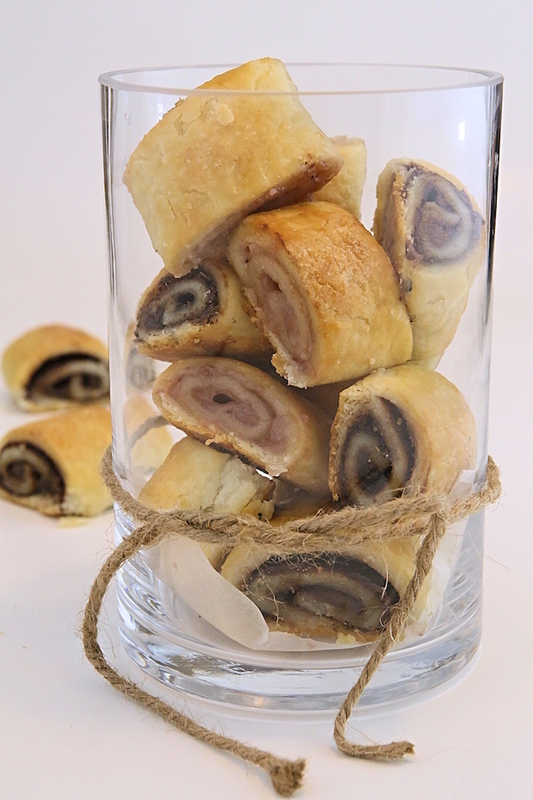 Semi-soft, yet flaky cookies are filled with a chocolate and jam/cream-cheese filling, then rolled creating a swirl like pastry. 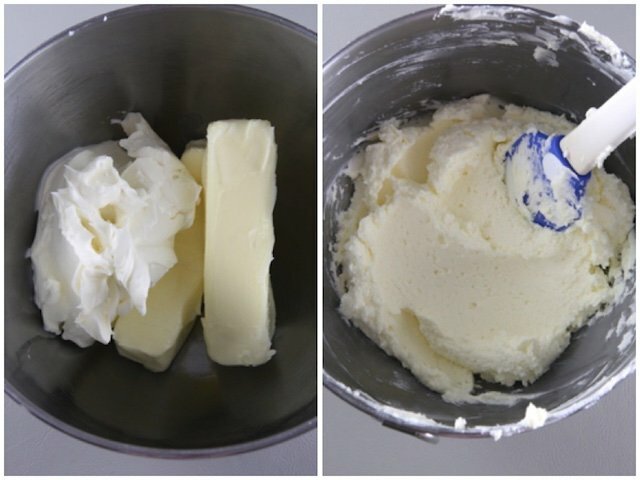 Beat butter and cream cheese until well combined. Whisk the flour and salt and add to the butter mixture. Stir together until a soft dough forms. 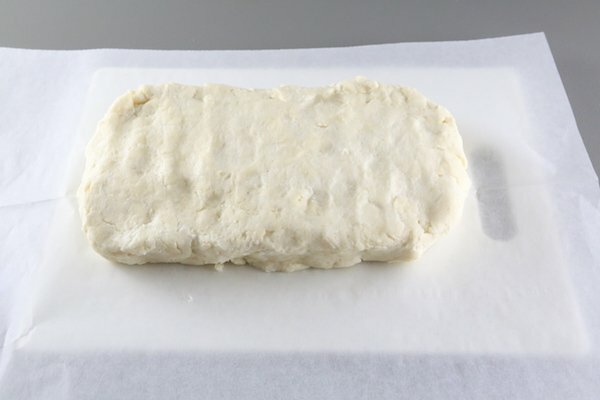 Flatten dough into a 7 by 5-inch rectangle; cover and refrigerate for 1 hr. 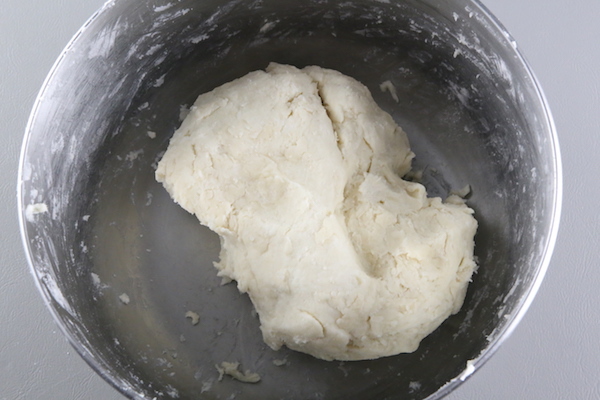 Cut dough into 4 equal portions. Roll out each piece into a 12 by 8-inch rectangle on a lightly floured surface. 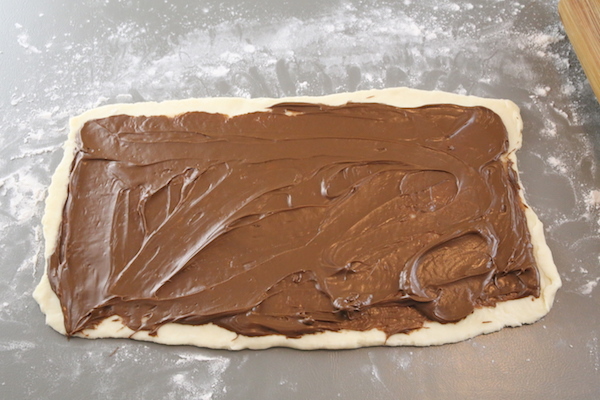 Spread 2 tbsp of nutella onto the dough (or half of the cream-cheese filling plus 1 tbsp of jam.) Roll, starting from the longest side pinching down the ends to seal the roll. 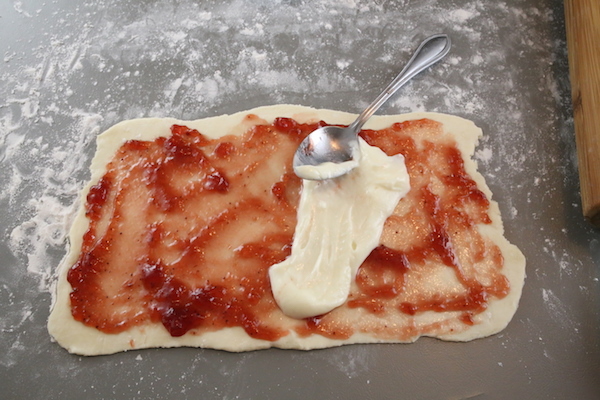 Arrange rolls onto a tray lined with parchment paper. Cover and refrigerate rolls overnight or 12 hrs. 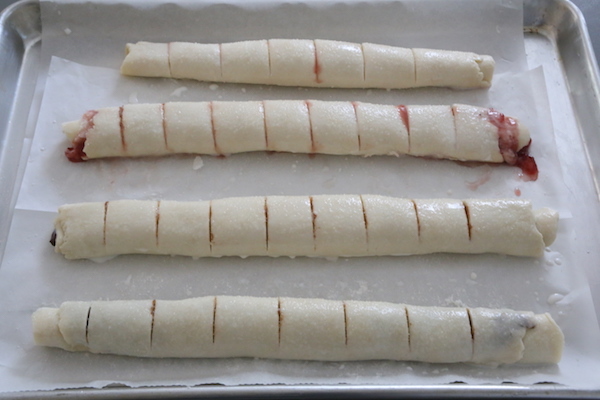 Preheat oven to 350 degrees F. Transfer rolls with parchment paper onto a baking pan. Brush the tops with milk and cut 3/4-inch deep (not all the way through) into 1 1/2" thick pieces. Generously sprinkle with sugar over the top and bake for 45 minutes. Cool for 10 minutes then slice all the way through. These look delicious!! Can these be made a few days in advance? like made on Thursday to be eaten on Sunday? Thanks!